Many people who want to get into shape don’t realize there is more to fitness than well-toned muscles. We’ve lost our focus on the interconnectedness between the body and the mind or spirit, and how each has the power to affect the other. The popularity of yoga classes, as well as other mind and body classes, is on the rise as more people begin to understand the amazing benefits of these low-stress forms of exercise. Whether you explore yoga classes, Pilates, or another form of movement for exercise at Club USA, remember that our bodies are made to move in order to feel good. So when you incorporate regular activity in your life, you’re moving closer to overall mind and body fitness. Club USA offers a variety of movement classes in our Core Studio to cultivate a love of exercise with mental fitness leading to a lifelong program of good health. These mind and body classes can help relieve stress, improve body awareness, and can reduce inflammation and muscle tension while improving attentiveness and awareness. Have you been wondering “Are there barre fitness classes near me?” The answer is Yes! We also offer Barre Fusion. These classes are a whole-body workout using an effective blend of ballet, dance, and fitness movements at the barre. Utilizing hand-held weights for a chiseled upper body, creative leg combinations that will leave your legs sleek and defined and isometrics for rock hard abs. Experience the physical and mental benefits of these amazing fitness classes. Club USA Fitness in Littleton, CO offers a wide range of classes that focus on core connection integrating an exercise ball, emphasizing center of balance. 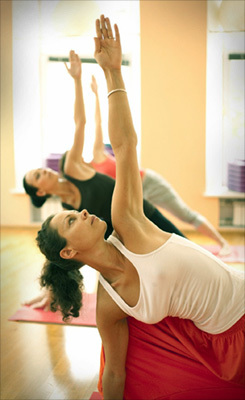 Classes in the Core Connection Studio: Yoga I, Yoga II Restorative Yoga, Meditation Yoga, Heated Empowering Yoga, Skinny Jeans-Barre, Pilates, and On the Ball Conditioning. Our Certified Instructors will be happy to offer modifications when needed. All Yoga classes take place in our Core Connection Studio Join us for yoga, barre, and Pilates in Littleton CO.
Have questions about yoga, barre or Pilates? Read our FAQ’s! Visit our Pricing page to look at our basic package plans for singles, couples, and families.